THANK YOU FOR ATTENDING THE COLLEGE FAIR! I am really interested in ___________, do you have a major that will allow me to explore that? I am interested in ___________ [program/subject]. Does your campus offer a program like this? What opportunities are available for internships? Undergraduate research? I would be interested in being involved in campus culture, can you describe some popular [activities/community involvement projects/hobbies] that students enjoy/partake in on campus? What's your most popular annual event for students? I really enjoy ______. Do you have a club or organization that I could join at your school? Can you describe the dining hall and meal plan options? How long does it take to walk from one end of campus to the other? How do students get around campus (walk, bike, drive)? What kind of transportation is available to the downtown area (if applicable)? Is it feasible to attend your school without a car? What is your priority application deadline? What is your merit scholarship deadline? Do you offer free counseling services? Does your campus offer any additional services or support for students with (unique circumstance)? Do you offer scholarships and financial aid? What starting wages can I expect with _________ career or major? The Path To College Infographic | Follow this timeline, starting Junior year of high school, to keep college applications on track. It includes tests, extracurricular tips, interviews, goal-setting, and more. Myers Briggs Personality Test | This personality test is highly regarded and is even sometimes used as a psychological assessment tool. Take the test to spark some self-reflection into your personality, to help see what type of college environment might help you thrive. Finding Your College Fit | BigFuture & The College Board Â |Â Whether you know what you want, or you have some preferences figured out, or you're not sure where to start, this interactive guide and search tool can help you start the college search process! Types of Schools | Federal Student Aid | Public or Private? College vs. University? 2-Year vs. 4-Year? Career School? Learning about the different types of schools out there can help guide your search! College Admission Glossary: Learn The Lingo | BigFuture & The College Board | Refer to this extensive glossary when you come across a term you are not familiar with during your college search process! "What's a transcript? What's the difference between early action and early decision?" This glossary is your friend! Federal Student Aid YouTube Channel | Check out this informative YouTube channel to gain necessary knowledge about everything Financial Aid! From learning the terminology, to step by step processes of determining eligibility and applying for your FAFSA, this YouTube channel covers it all! Dollars And Sense Handbook | Montana University System | This book is an extensive resource which teaches about financial management: budgeting, credit and credit cards, money management, financial aid, student loans, and more! College Coaches Use Social Media to Vet Recruits | National Association for College Admissions Counseling (NACAC) | "Hoping to play sports in college? Make sure your social media accounts send the right message to recruiters." This information about posting appropriately is helpful to anyone applying to college, not just athletes! Career Fields | Montana Career Information System | After you find some occupations you might like, you can visit this visual "Career Field" Diagram to see how a potential career option could translate into the courses of study and majors needed to lead to said career! College Fair Checklist | BigFuture & The College Board | Whether you have a strong idea of what you'd like to study or not, here are some tips for preparing for a college fair. How to prepare beforehand, questions to ask, etiquette to make an impression, tips for following up with those schools who you connected with, and more! 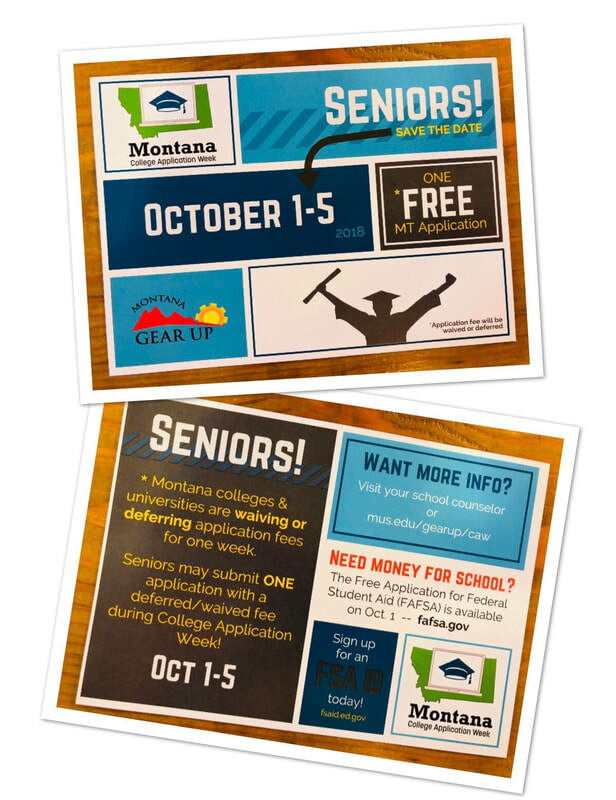 MontanaColleges.com | MontanaColleges | Learn about all the accredited colleges and universities in Montana so that you can get a sense of who you would like to talk to at your local college fair this September! Native American Scholarships | American Indian College Fund | Plenty of resources for the college application process - applying to college, college readiness, choosing a career or college path, tips for time management, and more!